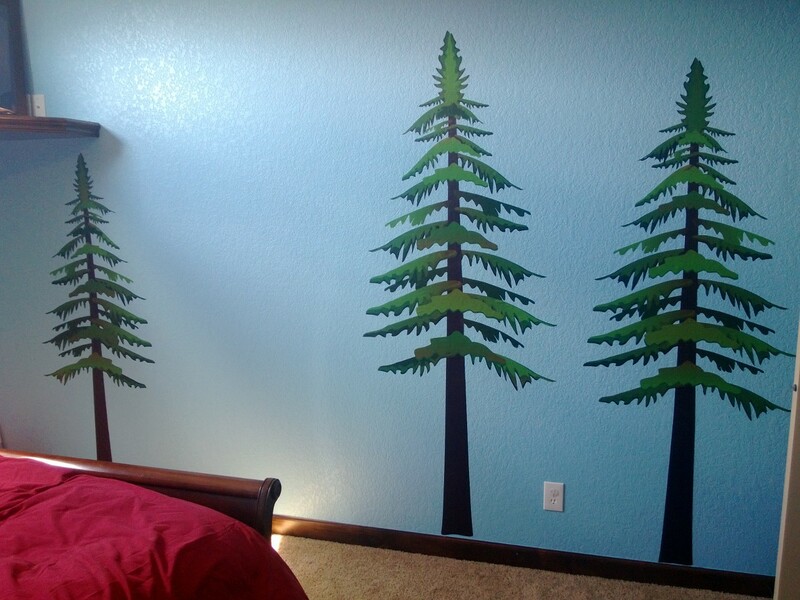 Matthew’s New Room – It’s in the Works! I have spent the last few days working on Matthew’s new room! 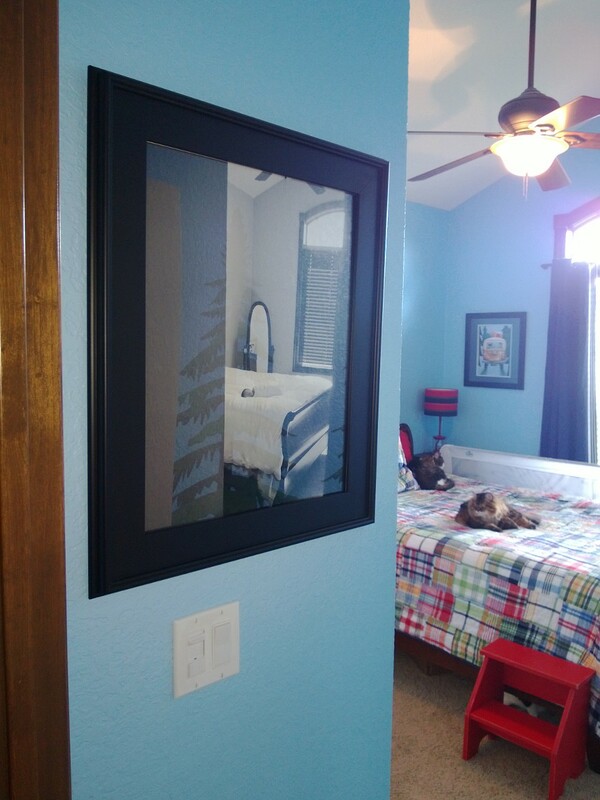 We weren’t sure what we would do – move him into the new room or give BB2 the new room. After much thought, we decided to go with our original plan of putting BB2 in the current nursery and moving Matthew to the front room. This means that I get to plan and decorate a new room = FUN! We had originally planned on using the theme, “The Great Camp Out” but we have decided to make it more “wilderness” focused than just camping. This was B’s idea and I like it a great deal! 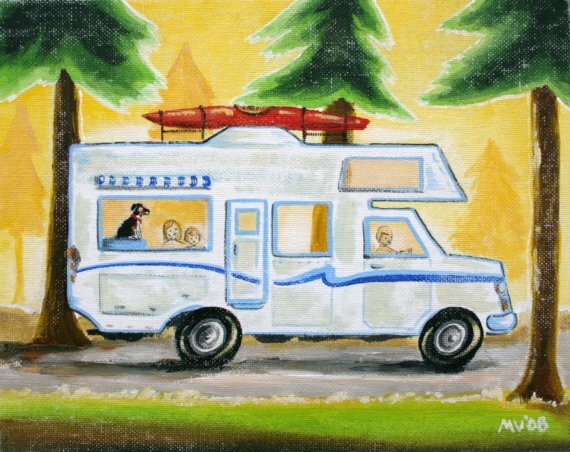 There will still be a camping feel, and my sister already gave us a beautiful framed print for his new room with a camper in it, but we’ve broadened the idea. I love Etsy – I mean – I love, Love, LOVE Etsy! I used Etsy for all of the nursery decorations and for Matthew’s first birthday, so it made sense to go there for Matthew’s new room. I started with a pretty flat idea, but it expanded as I found more and more things. Here is the print my sister matted and framed for us. It’s wonderful (and also from Etsy). 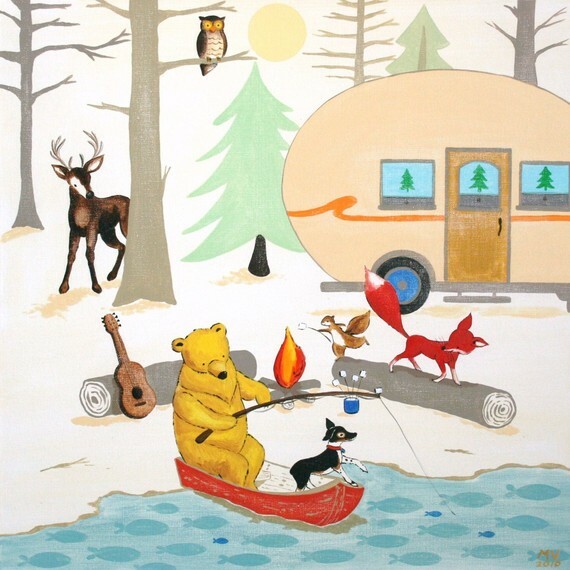 The artist is Marnie Vollenhals and she owns the J.AUSTINRyan shop on Etsy. We bought a couple of her original works for the nursery and we just love them. 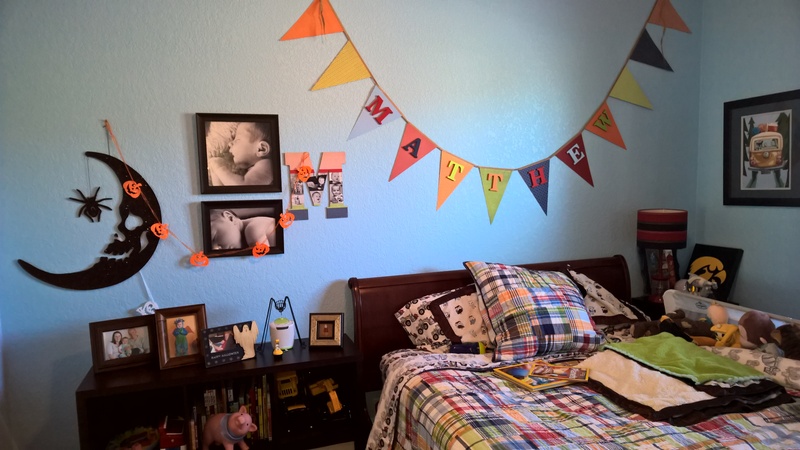 We’re thrilled to incorporate her work into Matthew’s new room too! 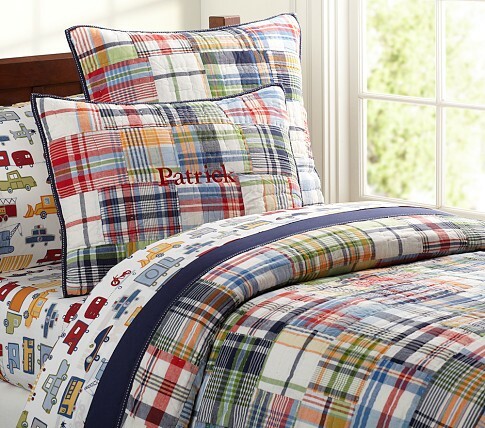 For now, I’m thinking of going with this bedding set from PB Kids (just the comforter, not the sheets). Not my first choice, but it’s the best thing out there right now and they have black-out drapes to match. I really hate PB Kids with a passion because I think they charge way too much for things, but when they have what you want, what are you going to do? 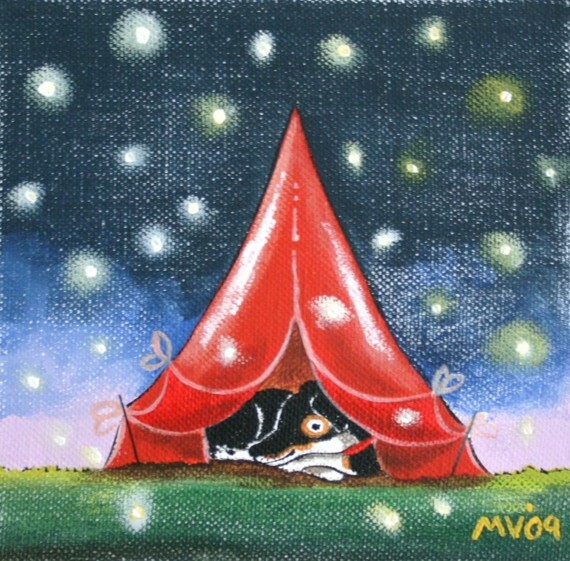 I’ve decided to go with the duvet instead of the quilt because it’s bigger, and this is going on a queen bed. I’m sort of sad about it, being perfectly honest, because I love the quilt. BUT – it is what it is. 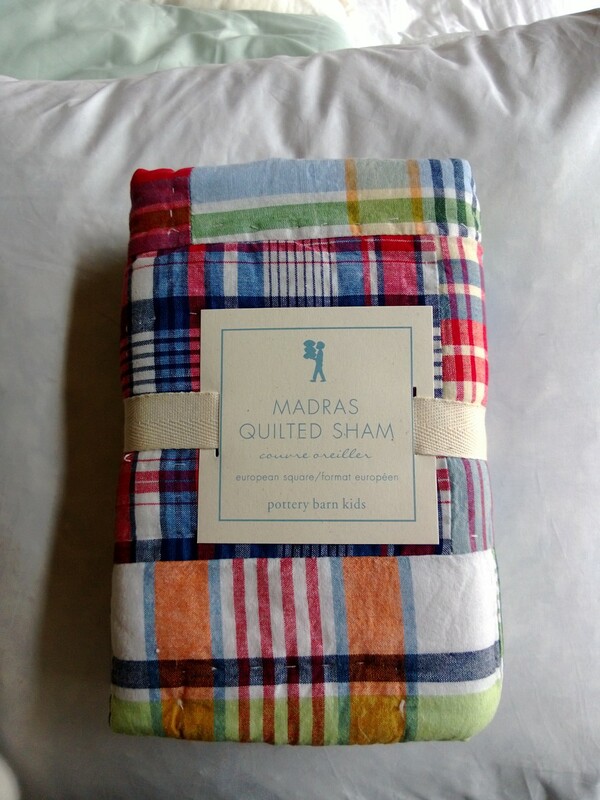 After visiting the store today (5/1), I was re-convinced to buy the quilt. The gal mentioned potty training, and needing to wash bedding, and the quilt being easier to was than the duvet. She also mentioned it not being too hot in the summer months and that I can use the duvet in the winter as a blanket, if I want. Good points – and I’m convinced! The flat, sort-of boring, duvet. Sigh. I need to check to see if the draps are like the quilt or the duvet. Hmmm.. Notice the light blue wall… see below on paint! After visiting the store today, I’ve decided that this curtain is better as to not be too “matchy matchy” with the comforter. B has agreed to paint the walls a nice light blue. Our entire house is brown and khaki – and it’s time to make some much-needed changes! I picked out paint samples and will get an estimate for the work this week (04/30/2013). 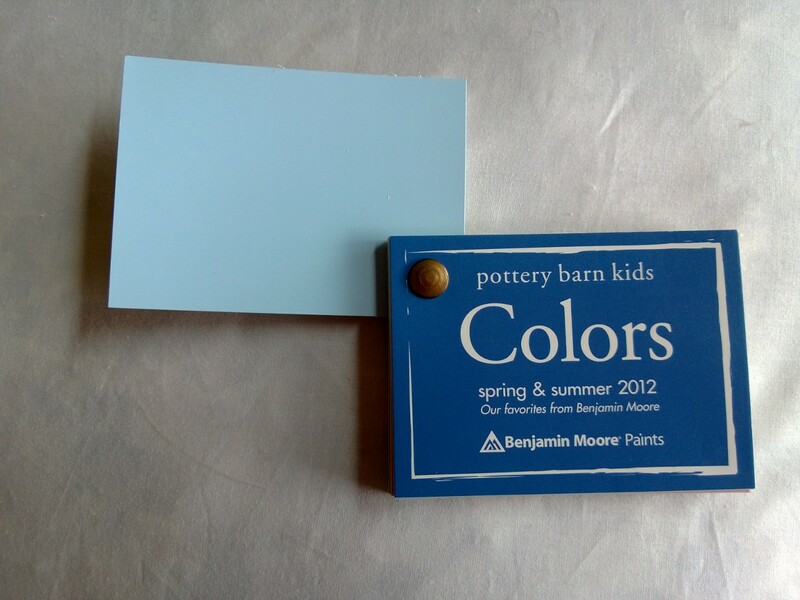 Color chosen after going to the PBK store – that was easy! We have decided to not go with a bunk bed for now. I stress the now because I do want to get one for Matthew in a couple of years. We are going to use the current queen bed that is in the room right now. It’s a sleigh bed from Ethan Allen which I searched high and low for back in 1999, so it is near and dear to my heart. I love the bed, and it’s very simple and plain. 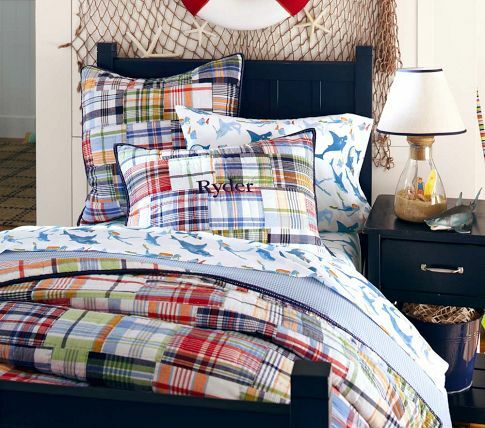 I also think it will make a great transitional bed for Matthew since it’s big and he roams around in his sleep. I figure, why transition him to a toddler bed – and then again to a big bed – when we have the big bed right now? There will be no other furniture in the room other than a toy shelf of sorts. We have drawers built into the closet which eliminates the need for a chest or dresser. I love this, because I just HATE filling a room with furniture! 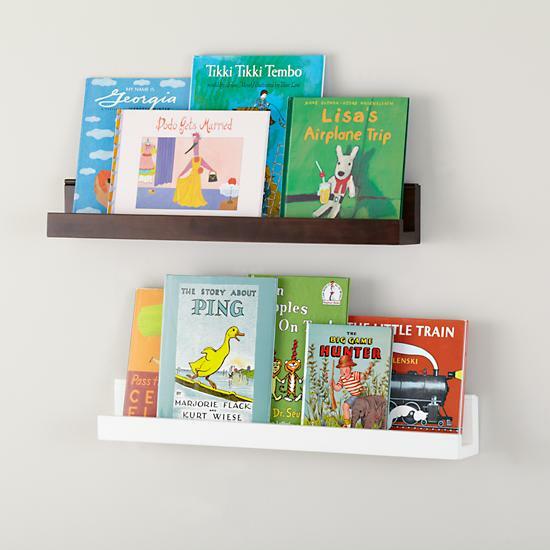 The toy shelf I want is from Tar.get and it’s great! I have the 6 cube version out in our living room (did this over the weekend while B was gone) and it’s nice looking, and the cubes are HUGE. I don’t need as big of one in his bedroom… trying to save space. I would even consider the 2 cube version if I wasn’t worried about containing all of Matthew’s books. B is working on coming up with a plan for putting a tent in the room. We’re only going to have a bed in there since the closet has drawers already installed – no need for a big chest or dresser, thank goodness! This leaves room for fun stuff, like toy shelves, tents, etc! 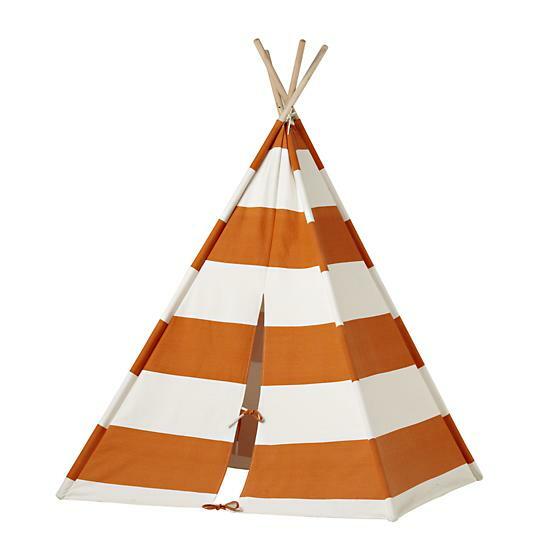 I am partial to this little teepee! I did go look on Etsy (Of course I did) and found this little gem. It’s fun because Matthew and I could decorate it ourselves, if we wanted, in the future – and it has windows! 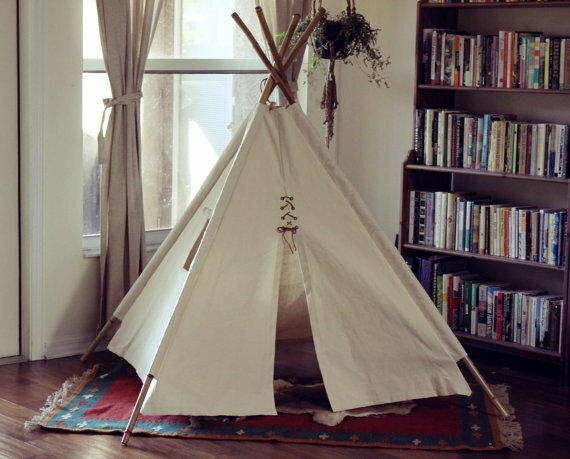 I saw another teepee on Etsy that has little pennant flags on top of the poles and I’m thinking of making some for his tent/teepee to coordinate it with his room. 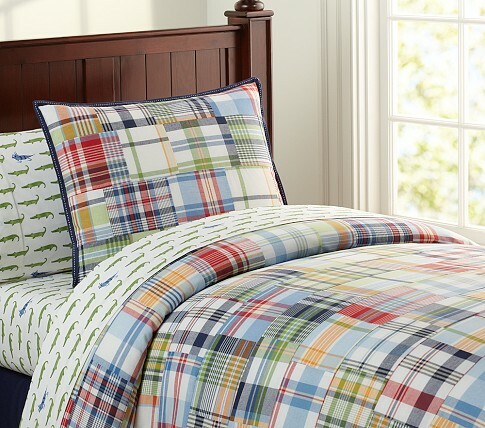 Land of Nod has these cute pillows, and I feel like I need them! Or.. I need at least one of them! Looking on Etsy, there are a million things I could add to this room, and I’m trying really hard to ignore it all. I will add things to this page, though, if I get them! 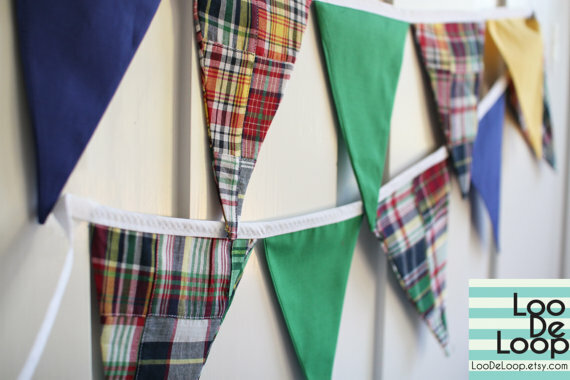 Here’s the first new thing to add – a pennant banner/bunting for above the bed. YES! I have tried very hard to ignore this, but the step stool we have for Matthew is too low for the bed. It does not work. 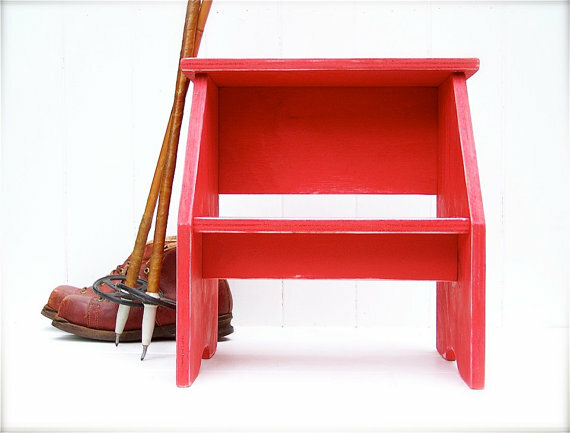 I think I’ll be ordering this awesome stool from Etsy soon. I hate the cost, but they’re so highly rated and loved by those who purchase them, that I think it’s worth it for a special room. So we need a lamp! 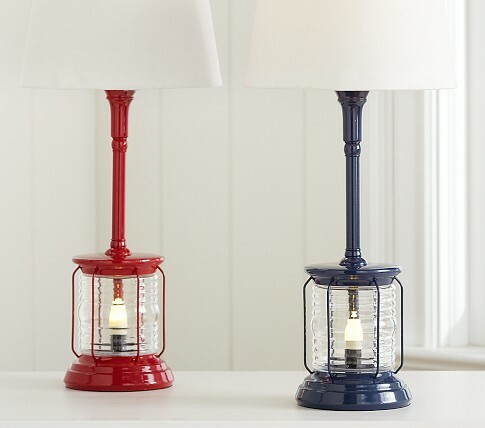 I have picked out this cute little lamp (in red) at PBK (GAH!) because it has two lights that turn on individually, and together. I like this idea! We have bought 3-way lamps at Tar.get and they have broken over time (months), so I’m OK with spending the money on a better lamp this time around. 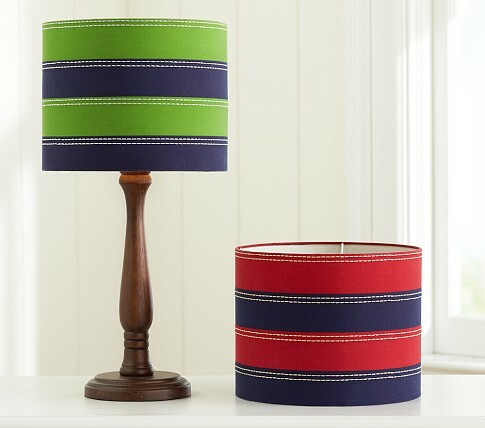 The shade I’ll be getting is this one (in red and blue) from PBK as well. Their shades screw into place, which is great! Matthew LOVES messing with his current lamp shade and that makes me a wreck! 5/1 purchased sham to match paint! 5/2 purchased and in the works! 5/2 – Ordered signs for the wall! 5/2 – I had a painter over to bid the painting work. I am waiting on the bid, but if it’s reasonable, he will be here next week! 5/5 – My signs are in the works – Tarra started them on Friday (5/3) and they are looking great so far! She’s posting photos of them to FB as she does her work, as she’s also communicating with me through Etsy, so this is really moving along and making the proofing process easy. I highly recommend Tarra at The Common Sign! They turned out better than I ever imagined! 5/6 – This has been a very productive day! I started the day off by going to PBK to buy the quilt, to see if it fits the queen bed nicely or not (it’s a full/queen quilt so who knows!). If it does not look great, I will trade it for the duvet. When I got there, the quilt was ON SALE! How often do you walk into PBK for a specific item and it ends up being on sale? I know – NEVER! So I bought it (which I was going to do anyway) and the second sham. The duvet is on sale too, so I’ll swap them if needed on Wednesday. I also booked the painter today (5/6), so we are making serious progress. Decals and signs should be up next week! 5/7 – I got the old bedding (so much old bedding!) and the mirror out of the room, and setup the quilt and sham. It looks great and even B loves it! The down duvet is in a red cover and on the bed too, and it looks so cozy. Getting the quilt on the bed helped me realize I need a shade deeper of blue for the walls, so I will pick that paint up tomorrow. Things are coming together… Oh! And my decals have shipped! That was fast! Putting the quilt on the bed helped me decide to stick with it, rather than buying the duvet cover. My signs arrived today – they look even better than the photo that the artist posted on FB. Here they are – in all of their pine-smelling glory! 5/9 – I didn’t make any purchases today, but I did look for less expensive foot stools on Etsy and picked up paint for my painter. The room is looking awesome! I didn’t like it at first, when it was just trimmed around the edges. It looked LOUD. Now that the first coat is up and dry, I LOVE it! I took Matthew in to see it tonight and he stopped in his tracks and said, “Oh!” That is his version of, “uh oh!” It was so cute! 5/10 – Painting is DONE! It looks great! Even B loves it, and he was a bit worried! The painter told me that when B came in to check it out while he was painting, he said, “oh… it’s bright.” Jeff assured him it would dry darker, and it did. I can’t put decals up for 2 weeks from today – so I am going to have to work on other things like cleaning out the closet and buying lamps and stuff. 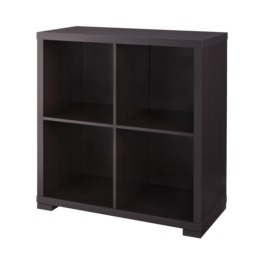 I did buy the cube shelf for next to Matthew’s bed – I got the vertical 2-cube shelf. I will put it together on Mother’s Day. 5/13 – What a productive day! I put the bedside bookshelf together today and picked out some fun display boards for photos and crafts. B bought me a polaroid printer for Mother’s Day and said that it will be fun to print pictures for Matthew, and that we should put them on a board in his room. That’s all it took for me to start looking for the perfect thing! I found it at Pottery Barn Kids, of course! 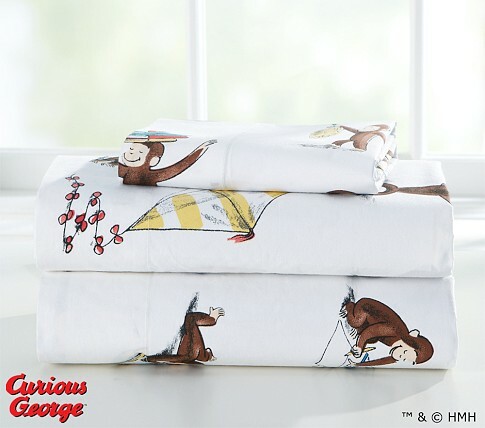 I did search high and low – Esty, Amazon, Land of Nod, PBK, etc. My dad gave each of the spouses money to buy a Mother’s Day gift for each of his daughters, so we spent the money on these. I love them! I got the top right blue bungee board, the bottom left red bungee board, and two silver magnetic boards. Here is the book shelf, all put together and loaded up with big boy books! We will bring Matthew’s favorite board books into his new room, but we think he’s ready for the more grown up, paper page books. He’s growing up! The decals arrived today but I can’t put them up until a week from Friday. The weekend of 5/25 is going to be BUSY! 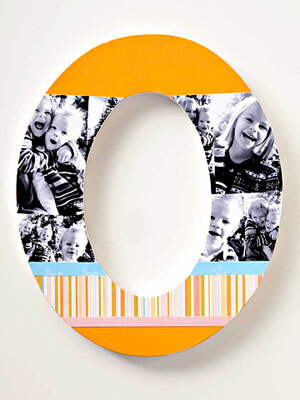 Decals, signs, photo boards, newborn photos, etc. will all be put up that weekend. Amazing! This weekend, we will hang the drapes! 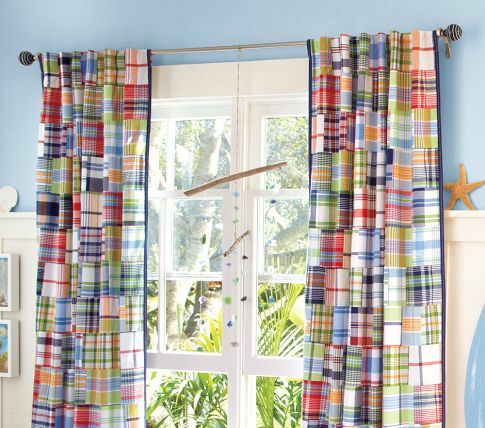 My curtain rod will be here tomorrow! 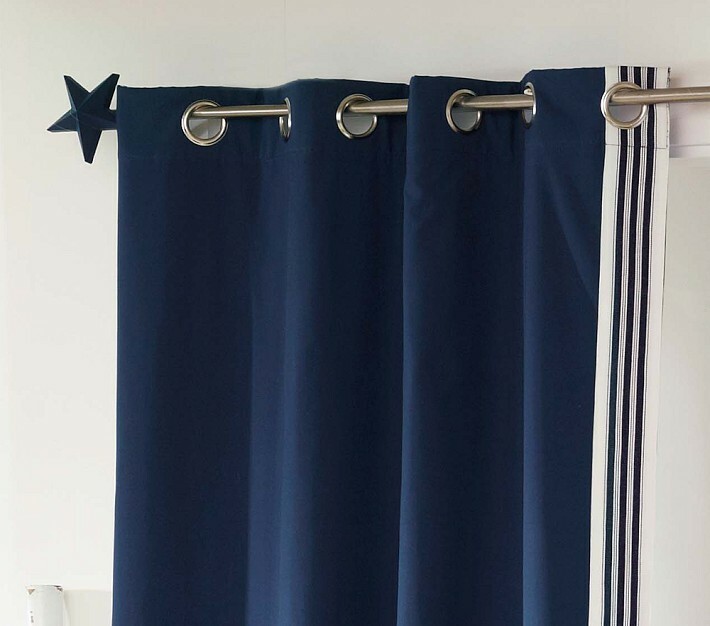 5/15 – The curtain rod arrived today, so I’m hoping to get it up tonight or tomorrow so I can get the curtains up and assess how well they work (they’re blackout curtains). 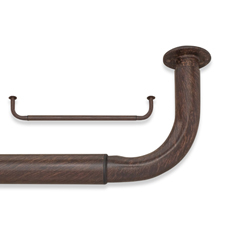 I also ordered the two side bed rails for Matthew’s bed. This was not that exciting of a purchase – but necessary! 5/18 – Bed rails arrived! 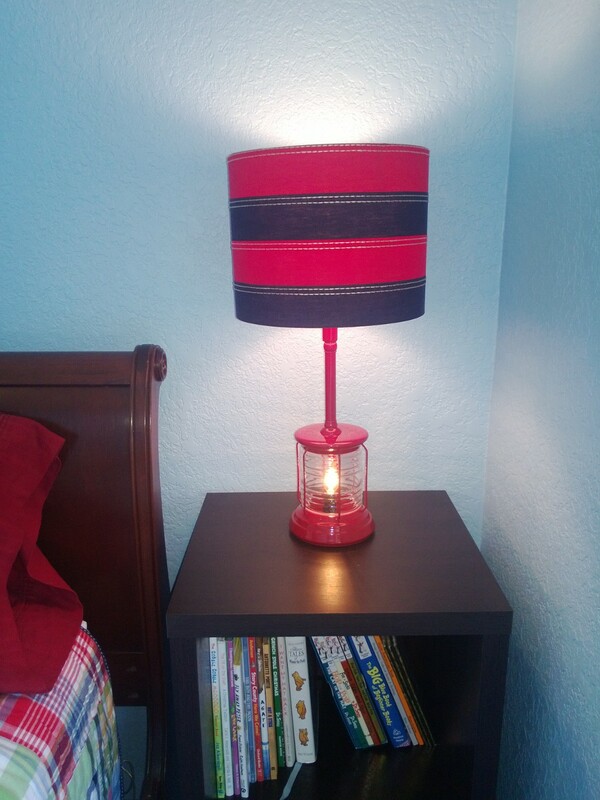 5/20 – I purchased the lamp… yes… THE LAMP. I tried to find something cheaper online, but there just isn’t one. I love this lamp so much! The base turns on, so does the top, and they also do together. It’s the perfect reading lamp! I also just ordered the waterproof mattress cover, which I’d forgotten about until the other day. I got a pretty awesome one that also protects against dust mites, bed bugs, etc. I say if we’re going to do it, do it right! And finally, I assembled one of the bed rails to see how easy it would be and it was a snap! Installing them may be hard since we’re putting one on each side, but B and I will work together on that! We have a lot of work to do on this room and are kicking it into high gear this week! Next up is getting the drapes up! 5/21 – B surprised me today by telling me that he installed the dimmer switch in Matthew’s new room – what a nice thing to do! I didn’t even ask – not once! He surprised me later in the day, then, by asking if I wanted his help to install and test out the bed rails. YES PLEASE! We got them worked out, at least enough to know how to do it once the mattress is in its waterproof liner. It was quite easy. It doesn’t look awesome, but what does one expect? They are bed rails, after all! So B took Matthew in to play on his new bed. He had a ball! He loves his new lamp – like – cannot get enough of it! GREAT PURCHASE! He had fun on his bed and we helped him figure out how to get down. We are for sure ordering his step stool though soon – so that he can get up without help! 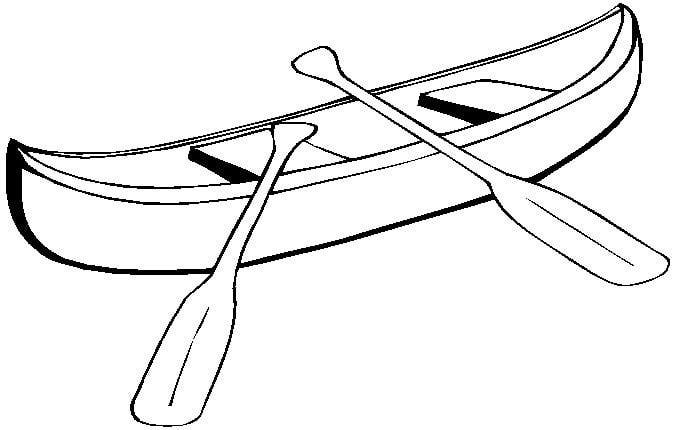 5/27 – We have been slacking off! With a weekend full of rain, we totally thought we’d make lots of progress on the new room. However, we were both exhausted when Matthew would nap so took that time for ourselves, and watched a movie together Saturday night, and… then Matthew got terribly sick Saturday night which took away any desire we had to work on things on Sunday. We spent the day consoling a very sick boy, leaving little time to work on the room. BUT – I did get one of the decals up today. It was not as easy as I thought it would be. These are made of fabric instead of vinyl, so they’re VERY bendy. I was a little upset at first because many sections didn’t seem to want to stick, but they’re stuck on pretty well now and I think they just needed time. 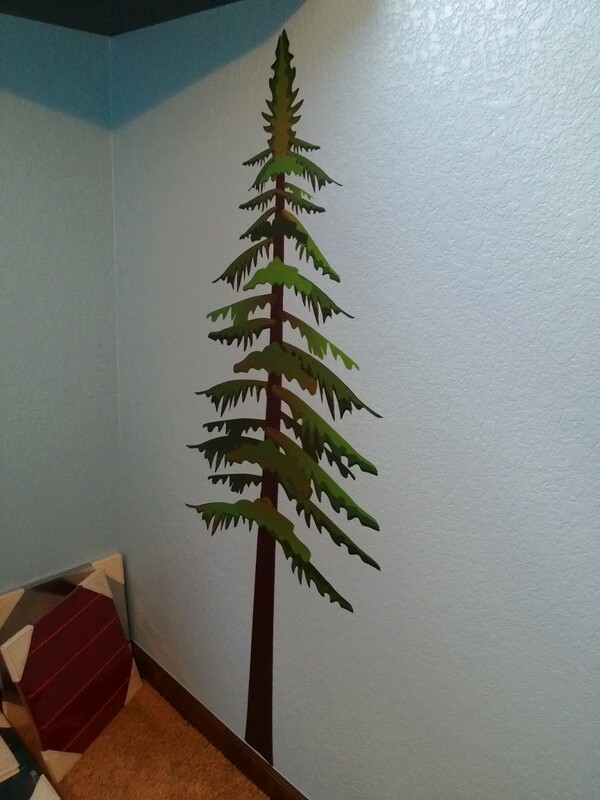 The lone tree looks great so far! I will do the other two tomorrow! Here is a sneak peek for now! Straight-on view of the tree. I REALLY love the blue behind it! 5/28 – Progress has been made! I put up the other two decals today and got the mattress protector on as well as the bed rails tightened. I think my friend is coming to stay this weekend, so I wanted that done! 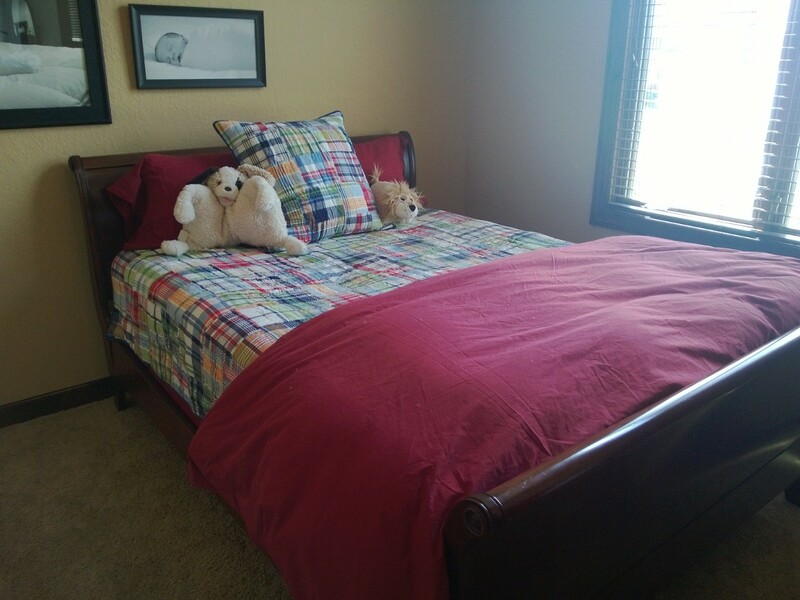 The bed is made and ready for her – not to mention that we need to get Matthew back in there for play time. Applying the decals was hard – I mean – almost in tears hard! These are fabric and they’re way more bendy than the vinyl ones, and they’re not seeming as sticky. I have to go and push them down a lot and will do for the rest of the day, and then they should be set like the ones I applied the other day. I do worry, though, that it will take just one swift peel from Matthew and I’ll be pulling my hair out. They look really good, and way better than vinyl decals – but I think I’d prefer the vinyl just for their stickiness. Anyway, they’re up now and I love them! 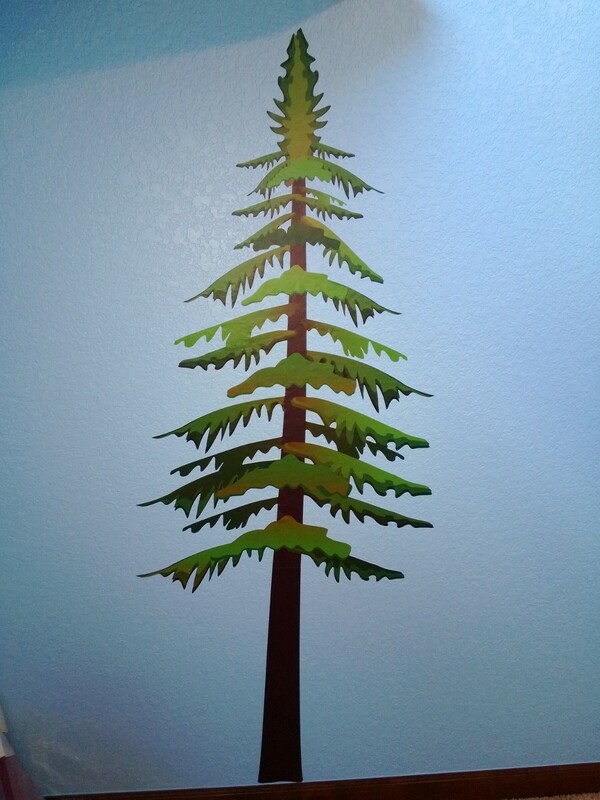 Three trees – all ready for signs to be attached! 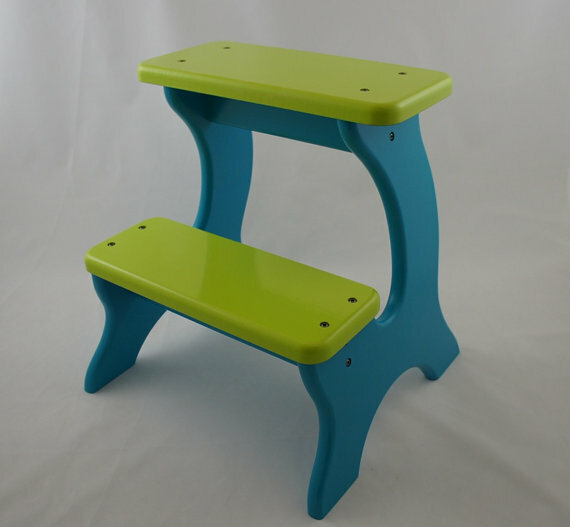 Oh – and B approved my step stool selection so I got that ordered today. HOORAY! Here it is – from Etsy, of course! 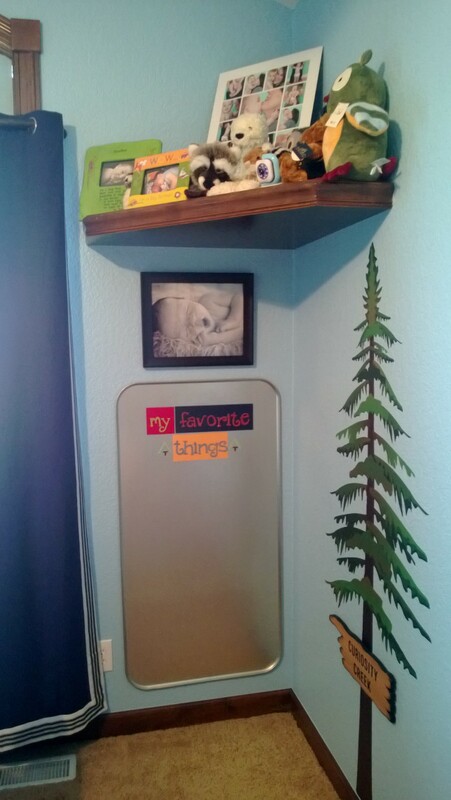 5/29 – I bought magnets for Matthew’s magnet boards in his room. I wanted something rustic and found these little dandies! 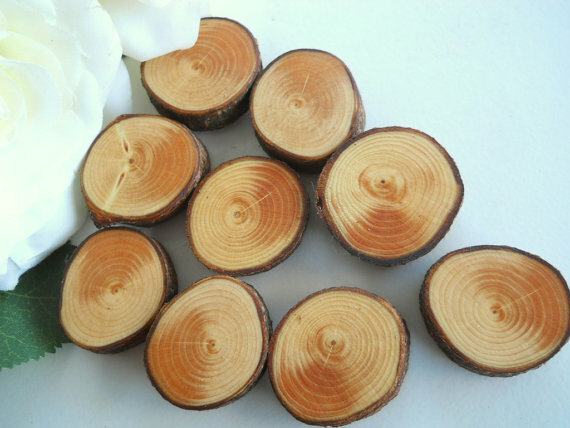 I’ve had them in my Etsy favorites for a while, but it’s time to get them purchased! I also did a test hanging of the curtains and they definitely darken the room nicely, so that’s great! I’m going to try to get those up tonight! 6/1 – The curtains and print are up on the wall! B and I did decide not to use the magnet and bungee boards I bought at PBK (B actually decided this and I went with it for good reasons) and figure something else out instead. My friend, Emily, was here and showed me this on Pinterest, so I am going to do it! Of course I’m going to doctor it up a bit! 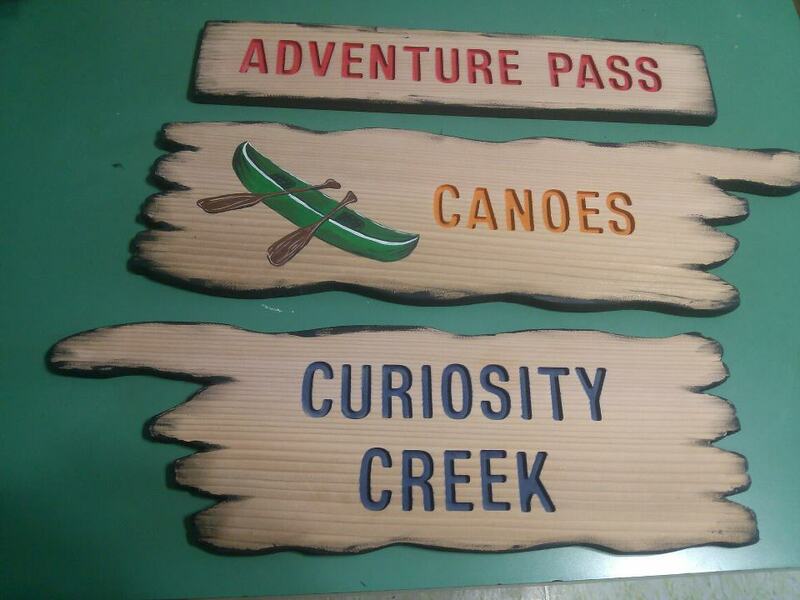 6/2 – I ordered 3M strips to attach the magnet board and trail signs to the wall… will be doing soon! 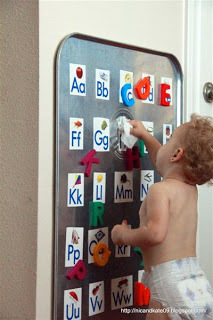 6/3 – We ran to Walm.art to get the oil drip pan for the magnet board! I will be working on some fun design to cover up the etching in it tomorrow! 6/4 – What a crazy, productive day! 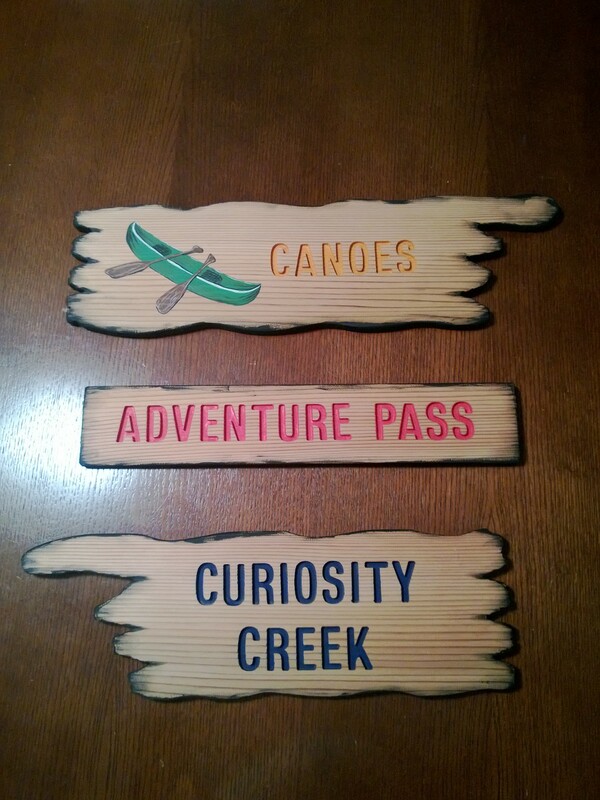 I got the signs hung on the wall and they look awesome – just like I wanted! It took more work than I thought though – and one attempt at the command strips peeled off my nice new paint. Ugh. We’ll fix that when we sell the house some day – it will be OK (I’m saying that for my own satisfaction!). 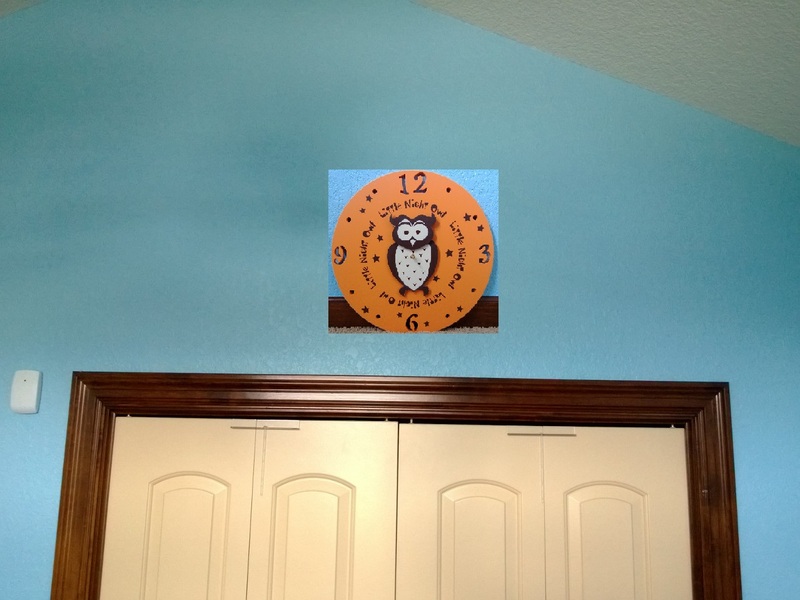 I also remembered the clock that I ordered for Matthew’s nursery a long time ago for his first Christmas. It never got hung because it would have cluttered the walls. I am so thrilled that the bedspread has orange in it so we can use it! I want to put it above the closet. Close-up of the clock! 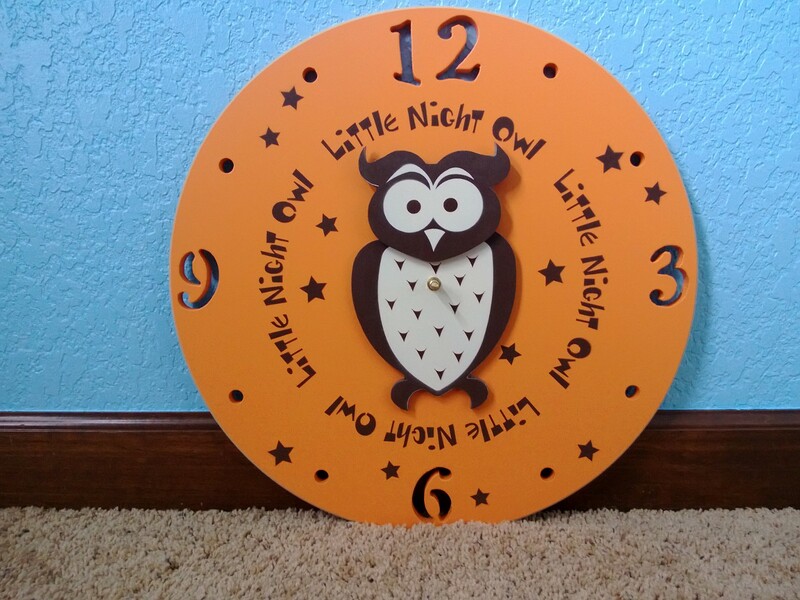 I just love this little clock and that you can have it made in all sorts of colors! Copied the clock in to see how it would look. I like it! I hope B agrees! Oh, and I worked on Matthew’s magnet board! It’s almost done. I need to get some metal paint to paint the logos to look like trees! 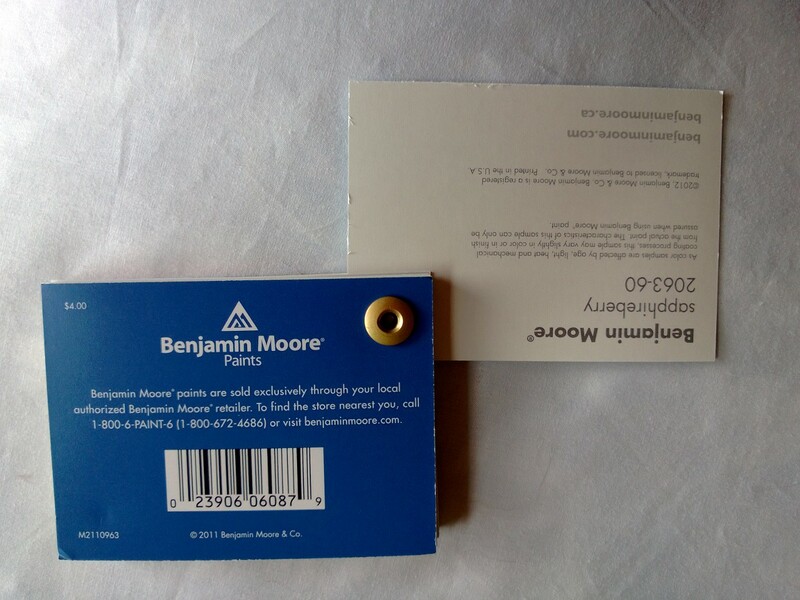 6/5 – Matthew’s magnets arrived, along with the hanging strips for his magnet board. I also painted the trees on the board so it’s ready to hang. Just for reference for anyone who cares – that magnet board cost $12 at Wal.mart and then I spent $10.50 on paint marker to ensure I got the right green. Had I known which green to trust, they would have cost $7. The letters and paper were all things I had in my craft inventory – so they were free. 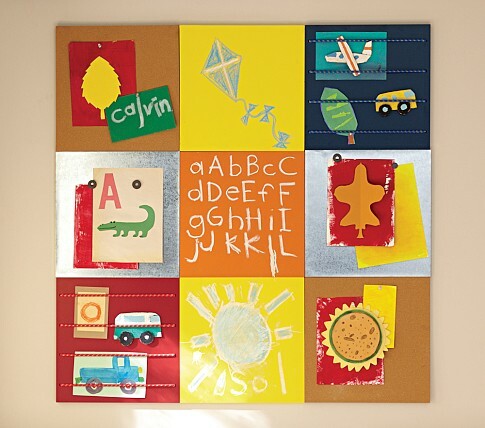 I think $23 for a magnet board it a great deal! Here it is – painted and ready to hang! I spent time today looking for picture shelves for the new room and this is really hard. I found a few that will work and will likely order them from La.nd of N.od. I am also working on his name banner, which is proving to be difficult. I need to find the right paper for the project – gah! 6/2 – The foot stool arrived today and it is PERFECT! It functions just great for Matthew and is the perfect height! 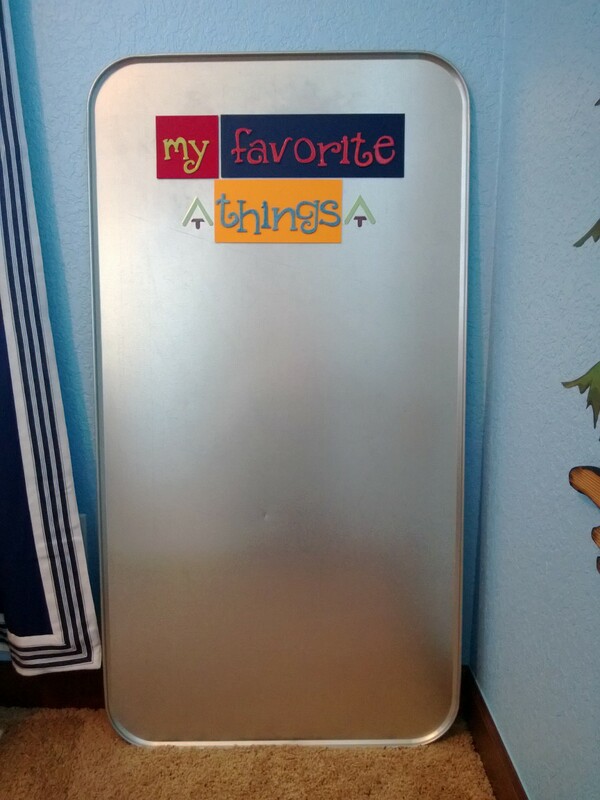 I also had to fix the magnet board today after one of Matthew’s friends tore off the letters on the “things” label. UGH! I had a spare and it wasn’t a big deal, but I did almost cry when it happened 😉 Matthew has had access to the magnet board since it was done two days ago and has never thought to tear off the things I put on it to cover the logo – but apparently not all kids think the way he thinks. HA! 6/7 – The magnet board is on the wall! The command strips didn’t work like they were supposed to (can’t remove the board), but they’re functioning as double-sided tape so that works. HA! It’s even perfectly level – and I did it all by myself! 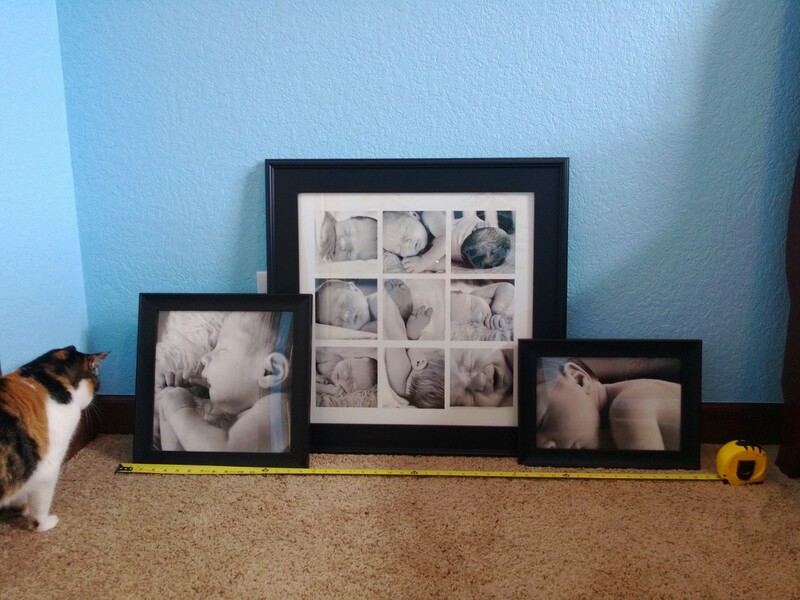 I also got Matthew’s newborn photos from the nursery that I want to put in the new room and measured them so I can order the right sized shelves. This shelving thing is becoming an issue – the ones I wanted from La.nd of N.od won’t work because they only come in one size, and putting two together makes it too big. Those are now out. I have searched everywhere and I’m forced to buy from Pot.tery Barn which pains me… but I do have $100 in gift cards to spend there after the return of the magnet and bungee boards I had bought for Matthew’s room. But man – they are expensive. Why am I forced to buy from there? 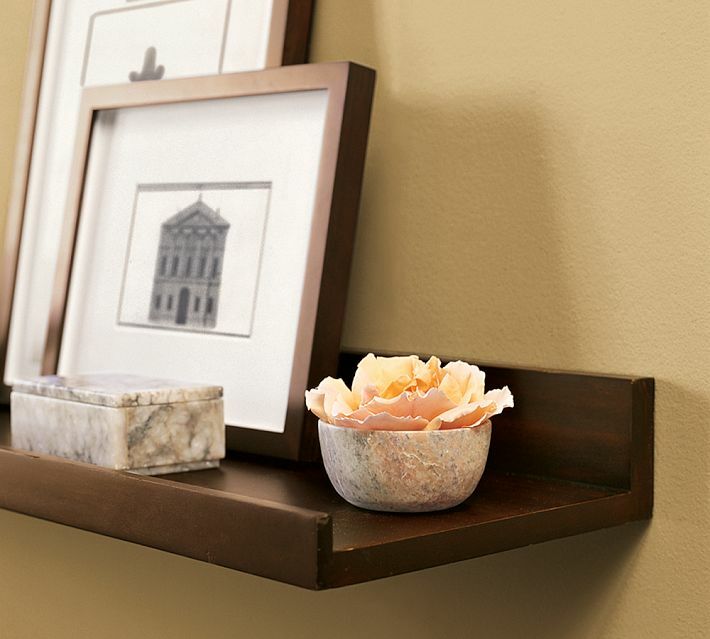 They are the only place selling 4 foot shelves with lips to ensure the photos don’t fall off. It is what it is. Look how safe (and deep) these are. Sigh. I will pony up the cash (and gift cards) tomorrow. Double sigh. Here are the newborn photos that will go on the 4 food shelf… very excited that we can move these into the new room! They will fit just perfectly in that space! We headed to Arch.ivers today to find paper for Matthew’s name banner that will go above his bed. I haven’t mentioned the banner yet, but it’s a must and IS happening! It’s going to be a lot of work, but I’ll work on it this weekend. 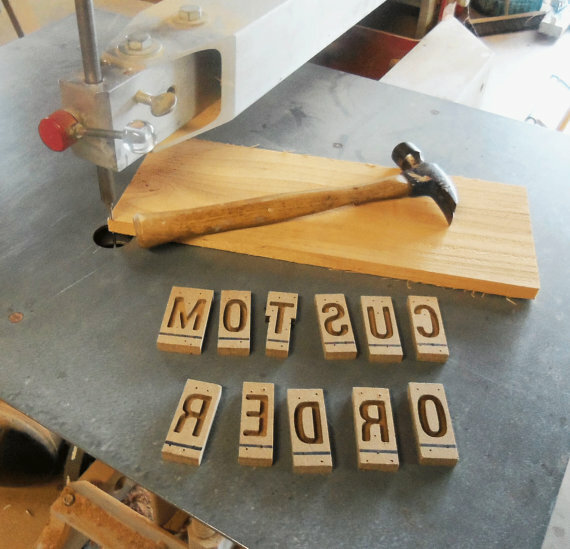 My sister, owner of Lewis Court on Etsy (a business that is booming for her – WOW! Check out her work! 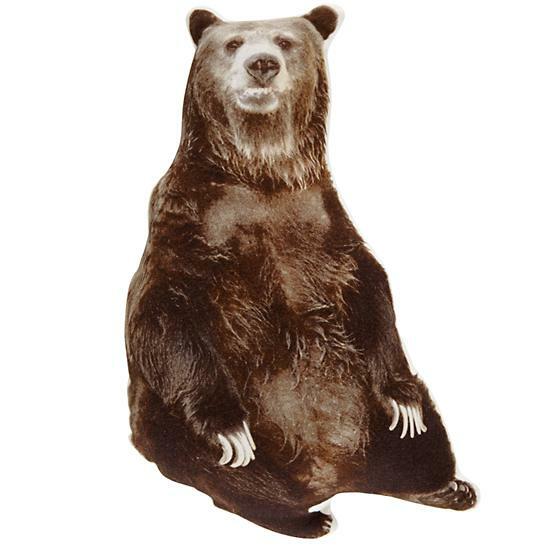 ), is sending me some papers that she has that will work for the banner. Thank you, Lindsay! I started selecting photos for my M photo monogram project but Shut.terfly died on me several times. There’s always tomorrow. Here is the inspiration behind this project which should be quick and easy, and will sit on the shelf with our new family/maternity photos. I just love this project and have been wanting to do it for a year! And finally, I decided to hang a photo that has been in this room since Matthew was tiny. My wonderful friend and photographer, Denise, took this photo of “a tiny baby on a big bed.” At the time, we had no idea that Matthew would use this bed as a big boy – we just thought he’d look cute on the bed, and then cute on the walls of the guest room housing that bed. This photo was taken by Denise in the exact spot where it hangs now. 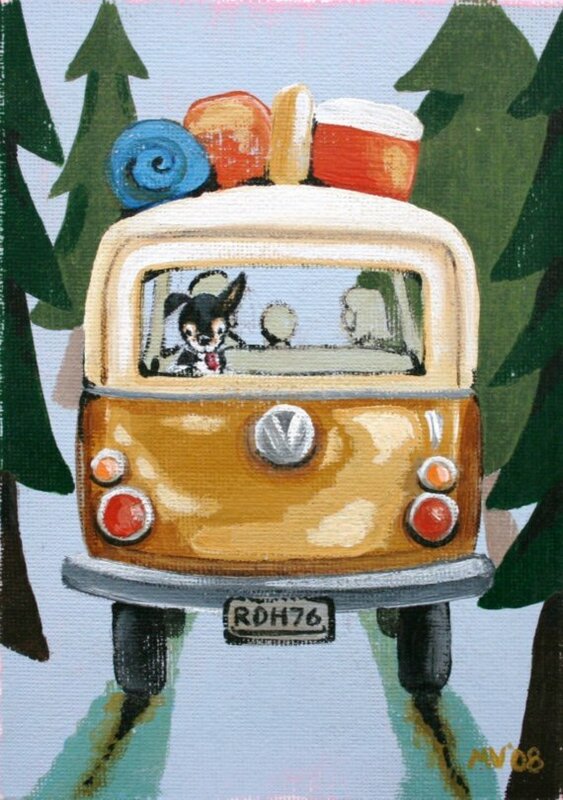 This reminds me of tinier times, and I love looking at it on my way into his room! This is so very special to me! Tiny, tiny boy who is now all grown up! 6/10 – Matthew and I went to the mall today to buy the shelves for his room! That will be fun to get done. We’re are almost there – just need to do that and hang the clock! 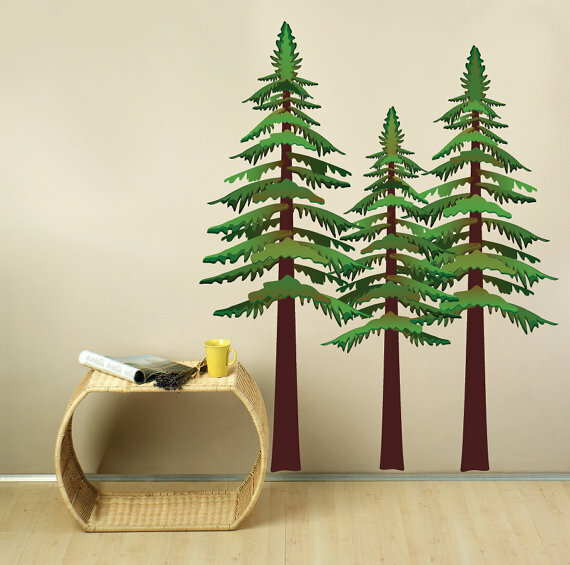 And put a forest scene above the corner shelf too, but that can wait! We also looked at solutions for the top window that has no coverage and is letting lots of light in that wakes Matthew up too early in the morning. Most solutions are $250-$600, so B came up with an idea that we will do this weekend. Should be fun and crafty! I also cleaned out space in the closet today for Matthew’s clothes, and moved all of his current clothes and diapers into his room. The room is really his now! The nursery is torn apart, getting ready for Bryson to arrive, and it is just Matthew’s nap room now. 6/17 – I have been so bad at making progress – in other words – I’ve made very little. Over the weekend, B cut the window cover for me. That took some serious work and geometry on his part to figure out the arch. He asked me for my math skills but I told him that geometry was never my thing – and that I was of no help. He found a nice formula online that explained it and from what he told me about this – he IS good at geometry! Even with the formula, I would have been stumped. 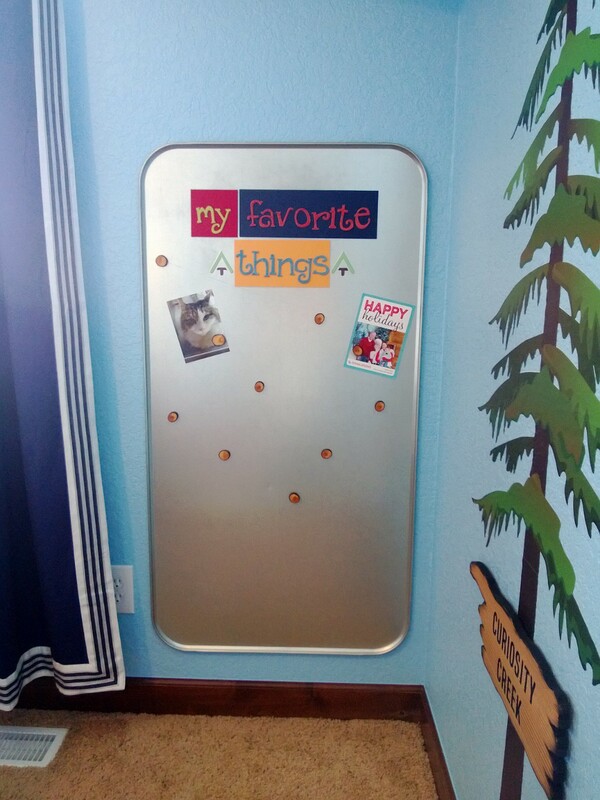 We debated taking the PB shelves back and just making our own, but that would have resulted in another PB gift card that would need to be spent one way or another (long story there – it all started by returning those magnet boards which my dad bought me for Mother’s Day). B agreed to just keep these and hang them. Of course, we didn’t get around to hanging them this past weekend. I did, however, get them out of their boxes today to discover that the 4 foot shelf came with no mounting hardware. The box had clearly been opened by someone else and some packing materials were missing too. I called PB rather frazzled because the last thing I have time to do is take a 4 foot shelf back to the store. They were super nice and offered to deliver a new one – and it was at the house within an hour. So these shelves? They are terrific. 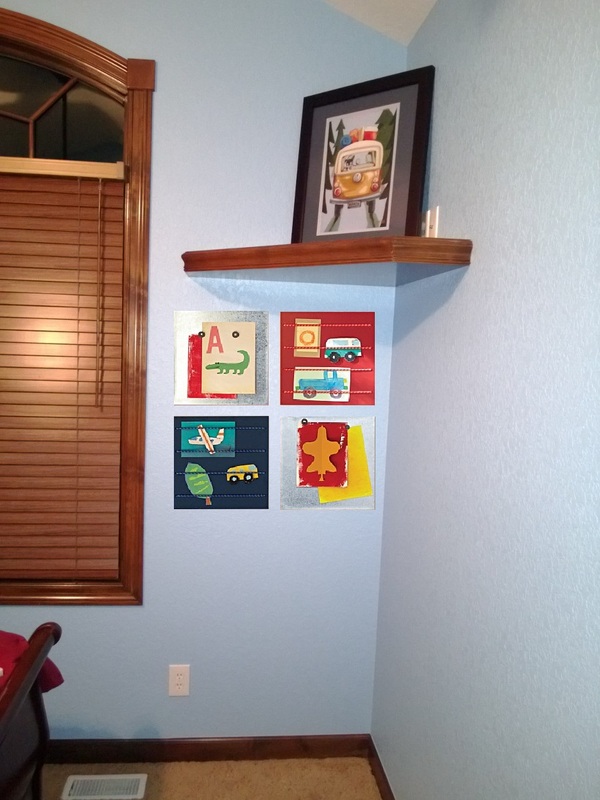 They’re nothing fancy to look at, but they mount so easily on the wall and are so spacious. I’m going to love them! They are worth every penny, and I don’t say that often about PB stuff. I did move out the final things in the nursery that were bought specifically for Matthew and put them in their proper spaces in his new room. The nursery looks bare, but that’s OK. We’ll fill it up with memories for Bryson! 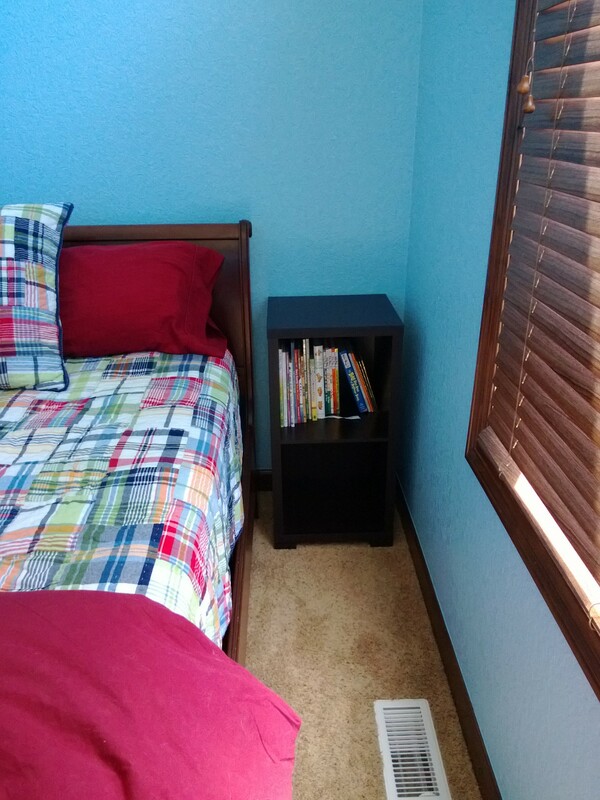 6/18 – I started installing the shelves, but B came up and saw me struggling (I really was struggling too – it’s not just his opinion), and offered to do it for me. He will hang them tomorrow! 6/19 – I know we’re getting down to the wire. Here’s my secret project I haven’t shared with anyone yet! I mentioned B cutting a wood cover for the top window and that is done – but what I didn’t mention is that I’m painting a mountain scene on it! I found the graphic and sketched it out – it seemed easy enough. Today, I drew it on the wood and it went rather well. I also painted the back side of the wood that will face the street – so I will be painting my heart out tonight and tomorrow, getting this thing ready to put up there! I also returned the shelves to PB. Long story, but the darned things wouldn’t attach to the wall. B will be building something! 6/21 – More painting occurred during Matthew’s nap time and this evening. 6/23 – Finished painting the mural and B put on the weather stripping that will seal it up in the window to block out all the light possible! 6/24 – Matthew’s Birthday and the mural is up! 08/02/2013 – Another project is completed! I will do a post on this and how I did it, but for now, here is a series of photos on the photo monogram! 08/03/2013 – I put the magnet board up again, after it fell off the wall quite a while back due to the Velcro strips not sticking. It seems to be nicely in place now! I also hung my favorite newborn photo of Matthew right above it – because above his favorite things should be MY favorite thing! 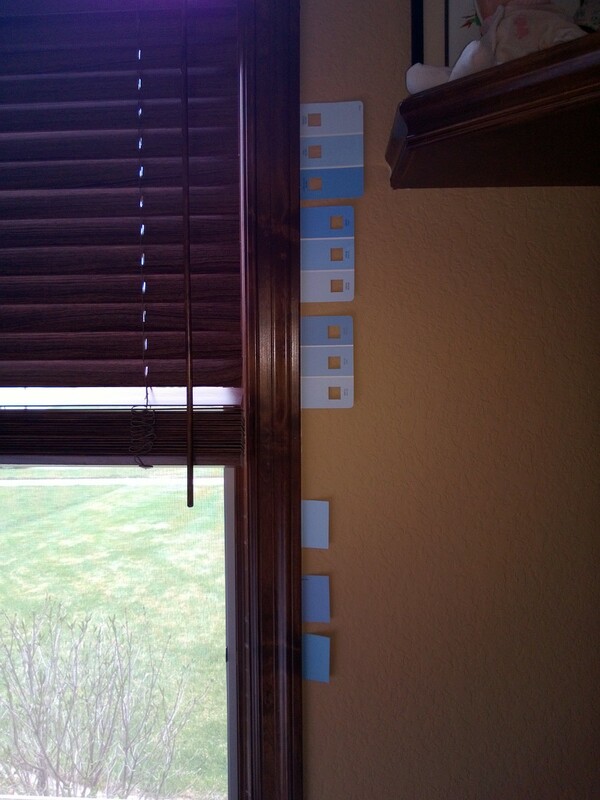 And finally, I measured and planned how to hang the remaining newborn photos – and I’m hoping to do that tomorrow! And… 2+ years later, I am finally done with this room with the completion of this banner. Feels good… feels oh so good to have this finished and looking so complete! Fun!!! 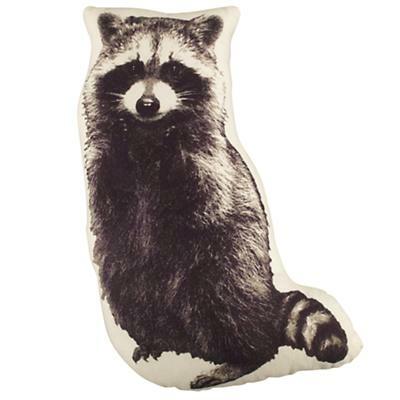 I love the theme and the sneaky little racoon that keeps popping up! 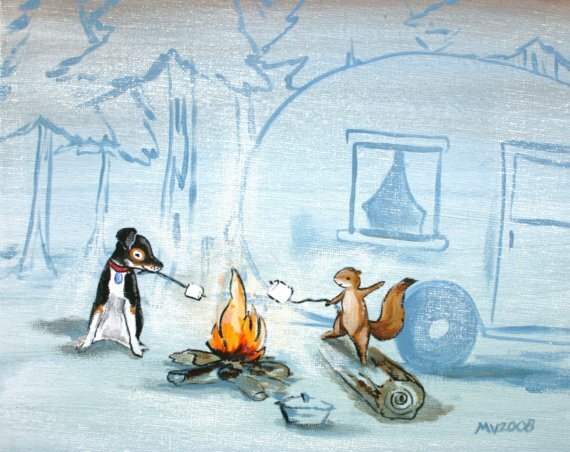 I also really love the squirrel and dog roasting marshmallows. I love this!!! 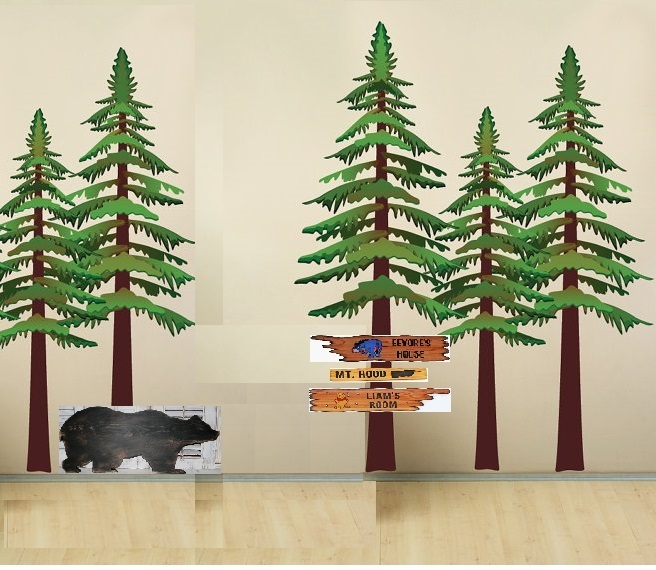 His room is going to look amazing! Thanks! I’m really excited about it! It all looks great! I love the blue on the walls, seems like it’s the perfect match for the bedding. I’d be dying if I had to wait that long to put the decals up, especially if I already had them! Thanks! I just love that blue! I AM dying waiting that long to put the decals up! Especially since we’re not sure if we ordered enough trees or not! If I need more, I want to get them ordered! Thank you! I love before, during, and after photos of projects! I just realized we forgot to take a before picture of our room and I totally meant to. Oh well, there wasn’t much in there besides a bed, makeup table and nightstand – and we didn’t paint so it’s not all that different I suppose.